Living in an apartment where there always seems to be no space for anything more? Is your tiny apartment just a heap of clutter and mess? Well, worry not because we have the ultimate solution for your house to look like your dream home! Check out these insanely clever ideas. Folds up into a shred of nothing. 3. The Toilet Paper and Magazine Holder 2 in 1. All other toilet paper roll holders should just go out of business. It can also be easily sewn at home. Because if you are sacrificing one thing in your small space, it will NOT be your alcohol. If you’ve ever yearned for the vast pantries of suburban homes, you can finally own a little sliver of that dream. Your tiny sink will look at you and wonder how you never thought of this before. 8. Corner Shelf for the smallest of bathrooms. So that you never have to worry about storing stuff in a small bathroom. Possibly the most well-designed ironing board ever created. It spells the E-N-D for your end table. 11. A Roll-out Table Drawer For All the Counter Work. 12. 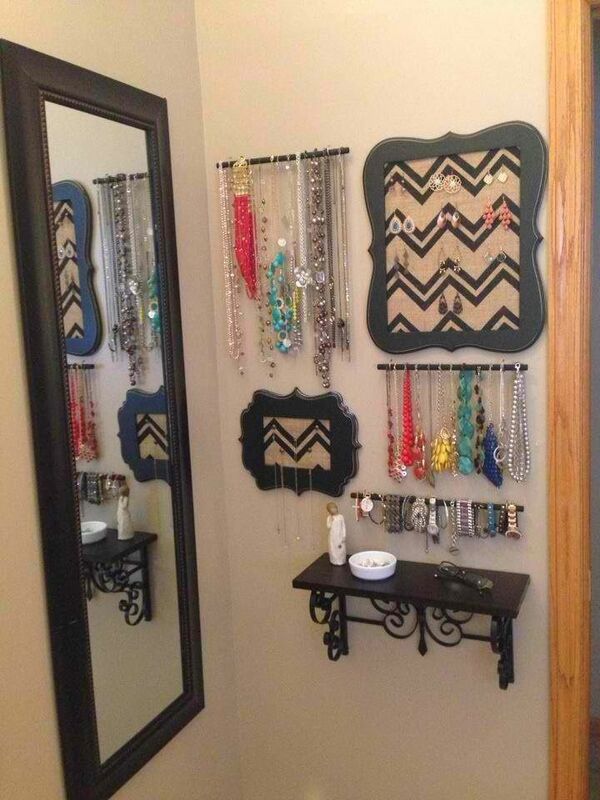 A Jewelry Display Storage For Your Bathroom. Cute and creative way to store and display your jewelry in your bathroom - small shelf, short rods, and black wooden plaques. They’re like little hungry munchkins that will “eat” up to five feet of cable to keep your media centers and office spaces free of clutter. To store all your child's junk in one place! In case your tiny home has also got a tiny backyard. It even doubles as a produce-washing station. You will never look at a cutting board the same way again. Just tell your boss you’ll be working from home FOR THE REST OF YOUR LIFE. For those of us who can’t help but have a chronic case of shoe overflow. Not only is it super functional and space-saving, but it looks like a cross-section of the world’s most beautiful Gobstopper. An innovative and beautiful room divider. You can have your marjoram and eat it, too. One hundred percent essential for anyone with a pedestal sink. You can’t call yourself a minimalist and keep your trash out IN PLAIN SIGHT. Keeps your everyday grooming tools in arm’s reach. For those with achingly precious counter real estate. Buy this as a passive-aggressive gesture toward your roommate who keeps her 13 different shampoos all around the rim of the bathtub. Behold, the magical power of hinges. Can these drawers just come standard with every kitchen from here on out? Check out the site for directions on how to get this space-saving drawer. So much better than one of those janky free-standing garment racks. This almost stupidly simple concept will make you wonder how you never thought of this before. At ~$100, this tiny workhorse is much cheaper than a washing machine and can fit 5–10 garments at once. It’s a mirror! It’s a bulletin board! It’s a coat rack! Finally, a piece of furniture that is all things to all people.